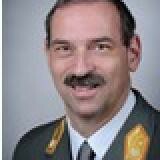 Dr Friedrich Teichmann is the Director of the Geo-Spatial Institute of the Austrian Armed Forces, responsible for providing Geo-Data, Geo-Info-Products and Geo-Services for the Land- and Air-Forces, national and international missions as well as to platforms and weapon/mission/simulation-systems. Before being in charge of the Geospatial Institute he was responsible to build up the ICT (Information- and Communications-Technology) -Innovation Department of the Austrian Armed Forces, focusing on interoperability and testing in the area of C4ISR, Electronic Warfare, IT-Security and Information Management. Until 2011 he worked in the Austrian Ministry of Defence, serving as deputy director of the Information and Communication Technology planning directorate, coordinating the overall planning and management of the ICT services of the Austrian Military. Before working for the MoD, he was the Department Head for Communications and Information Systems of the Austrian Air Force, focusing on modern Communications, Avionic and Command and Control Systems. Prior to working for the Austrian Air Force he was in charge of the geo-spatial section of the Land Component Command, providing national and international mission geo-data. He can look back over 20 years of professional experience in ICT systems, earth sciences, space applications and complex program management. He holds a Ph.D. from the University of Rochester in New York as well as Master Degrees from the University of Salzburg (Austria), the University of Maine (USA) and the University of Krems (Austria). He was able to maintain his academic involvement throughout his professional career at the Austrian Military by serving as external lecturer for Space applications, Information Technology, Geo-Sciences and Telematic at four Austrian Universities. Dr. Teichmann is also an international recognized expert for Information Management, IT-Security and Space Technologies and had acted has as national technical expert for the EU GNSS Galileo since 2006. He is a veteran of several international peace support as well as humanitarian disaster relief missions and holds a current rank of Brigadier-General. Check out the incredible speaker line-up to see who will be joining Brigadier General Friedrich.